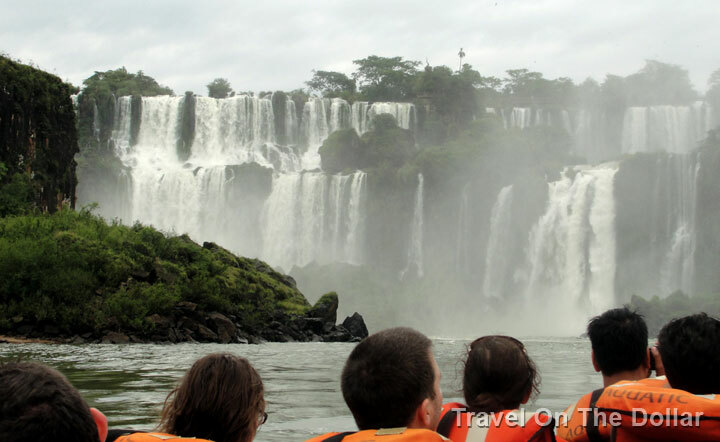 With a lot of changes in the itinerary and flight changes, we landed in Argentina and started with Iguazu Falls. Our flight was delayed so we ended up not going to the falls since the entry closes at 5pm. That gave us an opportunity to walk around the city of Puerto Iguazu in Argentina. A small city with a lot of tourists! It’s been humid and hot here. We decided to have dinner at a local restaurant called Sabores Inolvidables which is right next to our hostel – Marcopolo Inn. 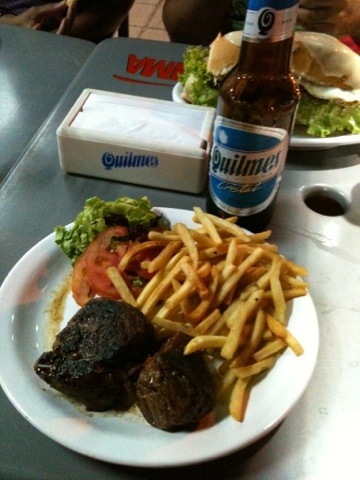 Try the steak with fries – it was amazing! The next day we took the 7:15am bus from the bus station, which is again next to our hostel, to the Iguazu Falls park. Bus number 8 (note that there are no numbers on the bus, so the only way to find out is either wait at the numbered terminal or just ask the bus that arrives at the terminal if they go to Iguazu Catartas) takes about 20-30 minutes from the terminal to the entrance of the park. Buses run every 20 minutes back and forth with the first bus leaving the terminal at 7:15am and last bus leaving the park entrance at 7:45pm. The entrance fee to the park is AR$100 per person and if you plan to visit the next day as well, then make sure to get the second day stamp before entering, and then pay half price (AR$50) the next day. Upon entering the park, you will see the Jungle office that runs boat rides to the falls, which is one of the most thrilling experiences and a must-do! The tour costs AR$260 per person and takes about 45 minutes. Note that the boat will pick you up from one location and drop off at another so getting a map of the park and keeping it safe is very important. We had a few hours to see the park so navigating our way from the drop-off point to the Central Station was an adventure. Although the park itself is not big as it may seem in the map, but experiencing it in a few hours (we had only 5 hours to see!) is not a good thing, so make sure to give yourself 2 days to make the best of everything. Everyone, including U.S. citizens, except for citizens of countries from South America, need visas to Brazil. It’s a simple process – apply online, setup an appointment and wait for about 3 weeks for the visa. You can then take the bus from Puerto Iguazu to Foz do Iguaçu, over to the Brazilian side of the falls. The company that operates the boat rides to the falls, Jungle, will take a live video of the tour and sells the DVD of the video for AR$200. The video is very raw, very amateurish and has no thrill or essence in it. All you would see is the people in the boat (you) looking over the falls and being excited about it. Isn’t that the whole point of the ride? So why keep showing the people? Why not show the falls themselves and then how everyone is having a great time? Also, when the boat actually takes you under the falls, the video camera is loaded in a glass box to record the later part; so most of the time you will see water-droplets on the glass box with random footage of the people in the boat. Someone should wipe off that water for a clearer view of the experience and maybe take some shots of the falls. We highly recommend not to spend that money (about US$47) on the DVD. Located in the heart of Puerto Iguazu and right across from the main bus station, this is a fine hostel with basic facilities and good, clean rooms. It offers continental breakfast, luggage storage, laundry service and Wi-Fi (which is not accessible from the rooms, but only in the hostel lobby). It was peak summer time when we stayed there and not all rooms were occupied, and the pool was dirty! But being accessible from most sights in the city and the bus station, this is one of our favorite hostels for backpackers. « This is exactly why I hate flight landings!